What material are the stencils made of? Are the stencils reusable? How long will they last? What paints/ mediums can be used with SP Stencils? Placing an order with SP Stencils is EASY! -Enter your payment information and click PLACE ORDER button. Once your order is placed you will be redirected to an order conformation page and also receive and order conformation email. If you have ANY issues whatsoever, email us at info@spstencils.com. Paying for your order at SPStencils.com is quick, easy and secure! All Credit Card Transactions are handled through PayPal so your transaction is secure and you’re protected as a buyer. We will gladly accept a check or Money Order by mail for your order. want to pay by check. Ordering online at SP Stencils is easy & convenient! You can browse through tons of stencil designs and size combinations and place an order right online. Or you can use our Custom Order Forms to create your own stencils! If you prefer to speak with us directly, email us first at info@spstencils.com and we’ll get back to you with our contact number. You will receive an email from us once your order has been placed & another email with your tracking number once your order has shipped. Please add info@spstencils.com to your contacts to ensure you receive confirmation emails. You can use the tracking number on the order shipped email to check the status of your order. SP Stencils orders typically ship within 1-2 business days. Flat Rate $5 shipping charge for USPS Priority Mail shipping (U.S. orders only). As of now we do not offer First Class, Express, or Overnight. International orders are shipped via USPS Priority Mail (usually takes 6 – 14 business days to arrive). Shipping rates vary for International orders. When you place an order with us we require 1 to 2 business days for order processing. Our stencils are made to order, meaning we don’t carry a large stock of stencils in a warehouse. This helps us with quality control. Orders are processed during business hours. M-F excluding holidays. If your order is time-sensitive, please email us at info@spstencils.com and we’ll do our best to meet your deadline. SP Stencils will not be held responsible for delivery delays caused by USPS. We process orders quickly in an effort to provide outstanding and expedient service. We are usually unable to make changes to your order once it has been confirmed. If you contact us immediately after placing the order, we will do our best to accommodate your request. If your order has already shipped and you need to make changes, you can return unwanted / unused stencils for a full refund minus shipping costs (Excludes Custom Stencil Orders, up to 30 days from the receipt date, minus any shipping charges). -If you would like to cancel your order (Excludes Custom Stencil Orders) and it has NOT been shipped, CONTACT US and we will issue you a full refund. SP Stencils offers stencils in three different materials: Adhesived Backed 7.5 mil, Standard 10 mil, and ClearCut Mylar 7 mil. Please see the Materials Guide for more information. Adhesived Backed 7.5 mil – Typically have between 1-3 uses. ClearCut Mylar 7 mil – Mylar stencils can be used between dozens to hundreds of times. The life of a stencil depends on how you treat your stencil. See the Materials Guide for more information on cleaning and caring for your stencils. How do you cut your stencils? Our stencils are blade cut using our top of the line stencil cutter, providing you with top quality stencils. Please ‘click here’ to reset your password. Select the Login / Register option at checkout OR in the upper right corner of any screen. All SP Stencils are offered in a variety of sizes, ranging up to 20″ in width! Because the details of various designs vary in size, please email us at info@spstencils.com with any questions pertaining to the sizing of a particular design and we will be able to provide you with exact dimensions. 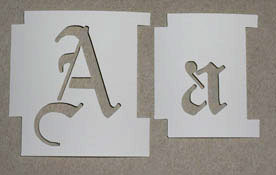 Alphabet Stencils can come in sizes of 1″ up to 10″. These sizes denote the height of the cut out stencil. 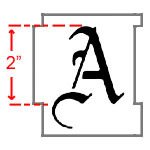 The height is determined by the length of the Capital letter “A” from the baseline of the letter to the top of the character…all other letters are sized in relation to it. This means there may be letters that will be bigger than the “A”. Check with us if you have size constraints. The lower-case letters are in many cases 1/2 the height of their upper-case counterparts. The sizes of the lower-case letters are determined by the font of the text and are kept to the scale that’s appropriate for that Alphabet. The images below show how different fonts are measured. 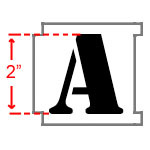 This image shows how the upper-case and lower case letters will differ in size. Custom sizes of any stencil can be created by special request. Please contact us by email: info@spstencils.com with your size preference and the product number and we’ll get back to you with pricing. Or you can fill out the Request Quote Form. We do not have a printed catalog. As we continually add new stencils, its hard to keep an updated print catalog. All of our stencils can be seen and easily searched on the website. 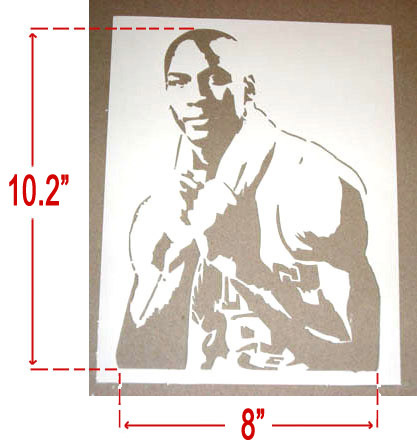 At SP Stencils, we can create Custom Stencils from your images or design files. Visit our Custom Stencils page for more information and instructions. For information on wholesale pricing, please email info@spstencils.com with the details of your stencil needs. Orders are processed & shipped within 1-2 business days. We currently only offer shipping via USPS Priority Mail for a flat $5 rate (U.S. only). Delivery time for Priority Mail is typically 2-3 business days. SPStencils.com makes every effort to keep our shipping costs as low as possible. Therefore, if you provide us with an incorrect shipping address and the package is returned to us marked “Refused/Unclaimed”, you are responsible for the costs to reship your order. We will promptly reship your order upon receiving payment and your revised address. Please be aware that the U.S. Postal Service is a third party service providers. We cannot be responsible for shipping delays or mistakes made by these carriers. The $5 Flat rate does not apply to International Orders. International rates start at $12 for Canada and go up from there. Typical international shipping costs about $24, but depends on the size of the order. All International orders are shipped through USPS (United States Postal Service) Priority International Mail ONLY. Shipping can take up to 6-14 business days to arrive (not including any delays in customs). Your order may be subject to import duties, custom tariffs or VAT charges. These charges are the responsibility of the recipient. If a package is marked “Refused/Undeliverable”, the original shipping costs are nonrefundable. International shipping is available only on custom orders via USPS Priority International Mail. Email us at info@spstencils.com or fill out the Request Quote Form to start an order. See Shipping & Handling Policy for more information. If you would like to place an order and do not see your country listed at checkout, please let us know and we will add your country. Currently, the only option we offer is USPS Priority Mail, which takes 2-3 days domestically and 6-14 business days internationally. For questions on estimated delivery times to your destination email us at info@spstencils.com. If you receive your order and it has missing, damaged, or incorrect products included, please email us at info@spstencils.com to discuss your issue. We strive for 100% customer satisfaction and if there is an issue with your order, we will do everything we can to resolve the issue for you. You may return any standard (non-custom) unused product purchased from SP Stencils within thirty (30) days from the date of shipment for a full refund minus shipping charges. Please use either the original or similar shipping packaging to ensure that the stencil arrives back in good condition. When returning or exchanging an item, please be sure to include a copy of your invoice and specify whether you would like to return or exchange the item. Customers making an exchange are responsible for return postage and shipping fees associated with the new order. Items must be in good, unused condition and in original or similar shipping packaging. Upon receipt of the unopened and unused goods, we will gladly refund your credit card or PayPal account for the full amount minus shipping charges. The information you provide is used to fulfill your specific request. This information is only used to fulfill your specific request unless you give us permission to use it in another manner, such as adding you to one of our mailing lists. We do not sale or share your information with any other companies. We implement strict security measures to maintain the safety of your personal information. Your personal information is contained behind secured networks and is only accessible by a limited number of qualified personnel. All sensitive credit information is transmitted via Secure Socket Layer (SSL) technology and then encrypted into our databases to be only accessed as stated above.